am/fm stereo cd, 2 anchors, new roller furling jib, alcohol stove, sleeps 4, 3 winches, 2 batteries with charger and ab switch, fold up ladder on stern, icebox, 3 sailbags, spare parts for diesel, new impeller and tools, twin keel, ideal tidal water pocket cruiser, With advancing age and a pension budget which precludes docking and storage fees, it is regrettably time for this long-time sailing fan to become a landlubber again. My Westerly Centaur, Andante, is one of few of this hugely popular design in the North American market. Production for this model, because of popularity around the world, was around 2,500, mostly sold in Europe and the South Pacific. 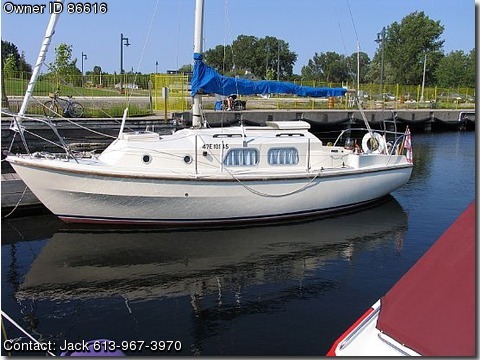 She is seaworthy, ready to motor or sail anywhere, in the water at this time at Belleville, Ontario, with easy access to Lake Ontario and the entire fresh water Great Lakes and canal systems, plus the Atlantic Ocean. Her extra-large 25 horsepower two-cylinder diesel engine chugs her along economically like an old freighter at hull speed of about five knots. This boat is so solid, spacious, reliable and steady that I could only wish it was the first boat I owned 30 years ago. Equipment includes fire extinguishers, flare gun, life jackets, hand-bearing compass, plenty of line, manual on the Volvo diesel, tools, utensils. Converted over to holding tank. Motor professionally serviced annually for past five years.